I first noticed this claim on the infomercial for WizeTrade stock trading software. 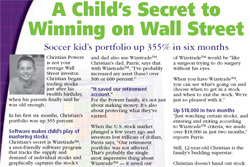 The infomercial features a 12-year-old boy named Christian Powers who made 355% using Wizetrade, including $700 on a single trade. 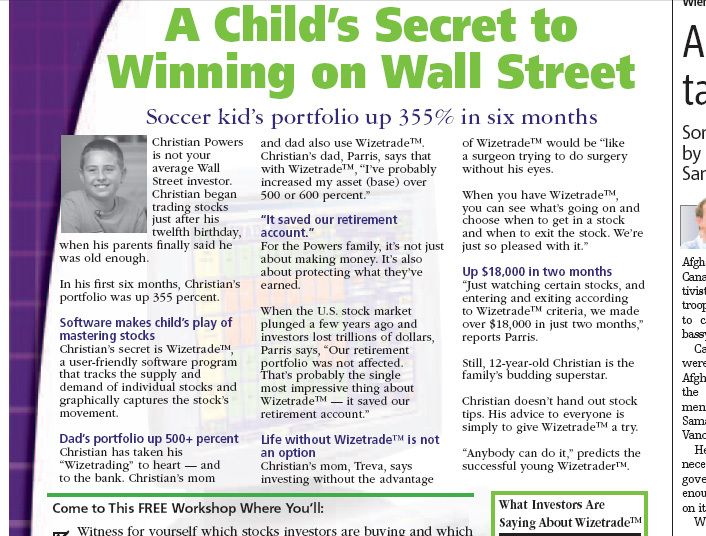 Click here to see part of a newspaper ad for Wizetrade that features Christian Powers with the headline “A Child’s Secret to Winning on Wall Street.” (You can go to this issue of Metro Vancouver to see the full ad on page 4.) Frankly, I’m not sure touting that “even a kid could do it” is a very good tactic when selling software, since many parents actually feel intimidated by their children’s superior computer prowess. So if you take your kid to this seminar and he ends up blowing all his real estate riches on cocaine and hookers, don’t blame Bob Allen! Sounds like a rip off of “So easy a caveman can do it”. Geico has been milking that one for years now..That and that stupid talking lizard. I’ve seen that Robert Allen infomercial, and I wondered how he was able to sign a contract at age 12. Is he the reason for the sub-prime mortgage meltdown? Just a quick suggestion…I’ve seen a 2 minute commercial for “Tater Mitts.” It was pretty silly and got me laughing. Have you seen it, and do you know if there’s an informercial? You can see the 2 minute one at http://www.tatermitts.com. No, I do not work for the company, I just thought it was a funny product.